As faithful Integrating Investors may know, my purpose for creating this blog is to further develop and refine my investment process. Recently, I’ve been giving some thought to incorporating technical analysis into my framework. Being open-minded, I should technically be willing to consider any technique that could provide an edge in investing. The popularity of technical analysis makes it a suitable consideration. However, just how sound are these approaches and what are their best applications, if any? There are few more polarizing topics in the investment community than the utility of technical analysis. To some, such as Peter Brandt, it provides a reliable framework for professional trading. Mr. Brandt has made a living trading his own account following the classical charting methodology laid out in this book for over 40 years. While his self-professed win rate is only around 40%, technical analysis has provided Mr. Brandt with a useful approach to managing his risk, which is truly the essence of professional investing and trading. TA and charting provide only a tiny edge to traders. The real edge comes from risk/trade management protocols, reigning in emotional urges and developing an organized process for market speculation. While the blogosphere is full of proponents and opponents alike, there’s also a rich body of academic research engaged in settling this issue. I recently read a review of such literature. The paper, Technical Analysis – Modern Perspectives (November 2016), was authored by Gordon Scott, Michael Carr, and Mark Cremonie, and can be found here. The review maps the evolution of various techniques employed in technical analysis and assesses the findings of various academic studies dedicated to the topic. While it may come off biased given that the authors appear to be practitioners writing for their own crowd, I still found it to contain a wealth of information. The underlying premise of technical analysis seems quite reasonable to me. The various techniques all are based on the assumption that the historical record of market data could be potentially useful for predicting future price moves. Price data is typically used – though not exclusively – with the hope of gaining some insight into how market participants may be positioned. I can get on board with that, especially considering my views that asset prices are ultimately governed by the laws of supply and demand (in which fundamentals play a role); that markets can have certain structures that may be exploitable at times; that behavioral and emotional biases can impact investors’ decision making process, and that; “there’s nothing new on Wall Street.” Thus I remain open to integrating valid aspects of technical analysis into my approach. That said, a friend recently reminded me of the wise trading adage ascribed to Joseph Granville, that “if it’s obvious, it’s obviously wrong.” Investing is fiercely competitive and it’s rare that widely available information is mispriced. 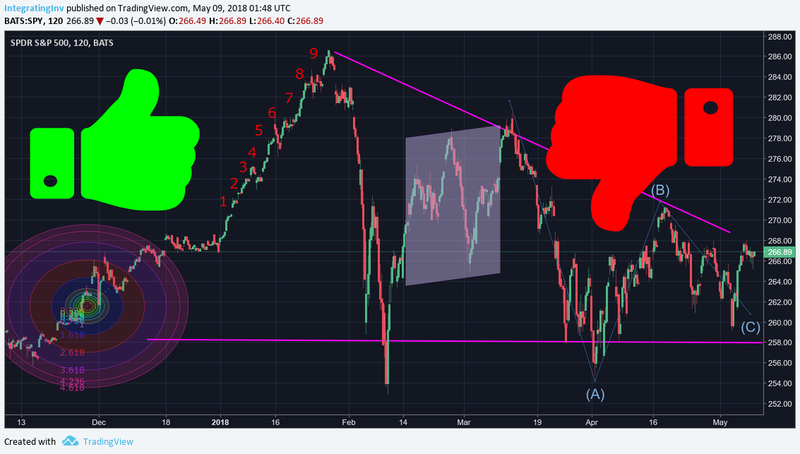 What can be more obvious in the modern age than drawing a bunch of lines on a price chart, especially when most popular technical analysis techniques come prepackaged into the most basic of all charting tools? Want to see the 200-day moving average? Click. How about Fibonacci retracement levels? Click. Japanese candlestick patterns, Elliot wave count, DeMark indicators, click, click, click. You get my point. Now practitioners would likely argue that reading a chart is an art form; that if you showed five chartists the same chart that you’d end up with ten different answers; that applying chart reading techniques requires one to develop a specialized skillset. You’ll get no argument from me here. But does that make it useful for me? So let me get this straight. Technical analysis works, but only sometimes, for some asset classes, and only during some time periods, for certain people. Uh, OK.
What are we to conclude? Should one consider incorporating technical analysis techniques into his/her investment framework? Well, I guess according to the literature, that all depends. Personally, I remain concerned with some of the more unscientific approaches taken (which, to be sure, does not apply to all), but also with the ease of applying common techniques, the obviousness of some of those conclusions (like breaching the 200-day moving average), and, in an age of algorithmic trading, strategies aimed at exploiting the novice technician. That said, technical analysis clearly can work at times, in certain markets, and for certain people. It also seems to have some some logical basis in reality (i.e. for potentially spotting market structures and as a risk management tool). Furthermore, as the authors of this review frequently note, technical analysis is rarely used alone, but more commonly in concert with other techniques, like more modern quantitative approaches or coupled with fundamental analysis. This latter part resonates with me more. Perhaps some techniques may be tactically applied as part of a larger strategy, like in helping to pick an entry point for a trade. After all, who hasn’t pulled up a price chart before executing a trade? Overall, I don’t think I could ever come to rely on technical analysis as the sole determinant for an investment thesis; but perhaps experimenting with it as a part of my process could bear fruit. Technically speaking, technical analysis has been found to create an edge at times. It’s up to each of us determine if and when it does in our own, individualized investment framework.